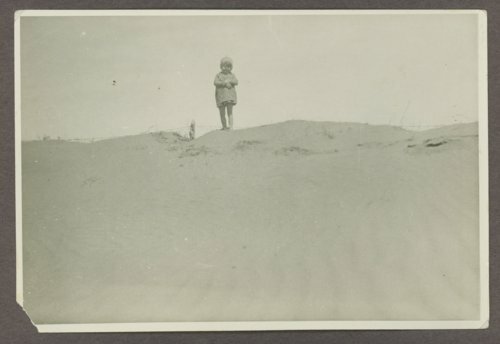 Here are two photographs, one showing Virginia McKinley, the daughter of John W. and Virga McKinley, standing on top of a woven wire fence at the northeast corner of the front yard on the McKinley-Ingleside Seed Farm north of Mullinville, Kansas. When the wind blew in this area of limited vegetation, sand covered the fence and posts. The fence was dug out using a team of horses, a slip, and a shovel. In the 1940s the family used Russian Thistles to create a fence of two woven wire strands approximately 18 to 20 inches apart then the strands were compactly stuffed with green Russian Thistles. This fence was placed on the west and north sides of the family garden. It stopped the wind from whipping the sharp grains of sand across the garden and cutting off the tender plants. The other photograph shows the same location taken on April 12, 2013.